VANCOUVER, BC, November 9, 2015 – Mirasol Resources Ltd. (TSX-V: MRZ, Frankfurt: M8R) (“Mirasol”) is pleased to announce JV partner Yamana Gold Inc. (Yamana) has commenced an aggressive southern hemisphere summer exploration program at the Atlas gold – silver project, one of the nine properties within the Gorbea Belt JV (see news release March 26, 2015). The planned program at Atlas includes phase 1 drilling of a planned 7 priority holes, totaling over 4,000 m, as well as expanding by up to 30 line-km the existing coverage of the deep-penetrating IP geophysical survey (see news release July 28, 2015). Additional trenching is planned to test key gold – silver rock chip and covered geophysical anomalies at the project. Atlas Gold Zone: Surface rock chip sampling has returned assays ranging up to 50.3 g/t Au and 56.9 g/t Ag, and trench results of up to 1.67 g/t Au over 14.9 m associated with vuggy silica – alunite breccia (see news release July 23, 2014). 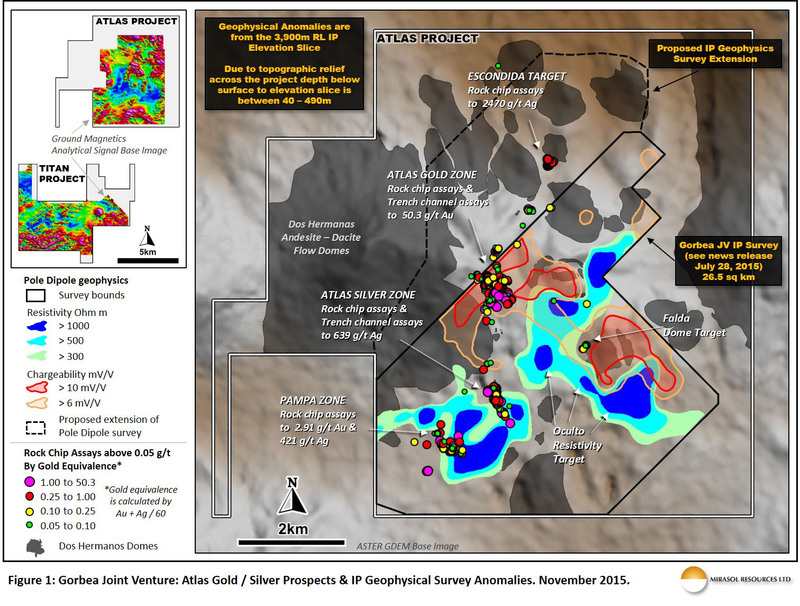 Atlas Silver Zone: Trenching has outlined a section grading 39.9 g/t Ag over 55.9 m, and individual samples of up to 542 g/t Ag, over 0.2 m, associated with hydrothermal breccia bodies (see news release December 10, 2014). Pampa Zone: Rock-chip float sampling has returned assays of up to 2.91 g/t Au and 421 g/t Ag, and recent geophysical surveys by Yamana have outlined a resistivity anomaly under shallow cover, with dimensions of over 1 km in length and which is potentially associated with hydrothermal silica accumulations (see news release July 28, 2015). Escondida Target: Sampling of breccia and vein float samples, thought to have come from a nearby, late gravel-covered source, have returned assays of ranging up to 2,470 g/t Ag (see news release July 28, 2015). Oculto Trend: A Yamana IP geophysical survey during July expanded the dimensions of a large, covered, resistivity anomaly to over 2 km in strike. This resistivity anomaly presents a series of priority drill targets (see news release July 28, 2015). Mirasol’s management is encouraged by the scale of the drilling program initiated by Yamana as an initial test of the Atlas project. The planned phase 1 drilling is in excess of the minimum 2,000 m required under the Gorbea Joint Venture agreement, and demonstrates Yamana’s commitment to test the large-scale mineral system at Atlas. Drill results for this program are anticipated to be received in batches over the coming months. Additionally, at the adjacent Titan project, terms of the Gorbea JV require that a deep-penetrating IP geophysical survey and a minimum of 1,000 m of drilling be completed before May 9, 2016. A drill program is being finalized while awaiting drill permitting for this project. Under the terms of the Gorbea Agreement, all exploration is managed by Yamana. All previous exploration on the projects was supervised by Mirasol CEO Stephen C. Nano, who is the Qualified Person under NI 43-101, and Timothy Heenan, Exploration Manager. All information generated from the Gorbea Joint Venture program is reviewed by Mirasol prior to release. The technical interpretations presented here are those of Mirasol.